This Friday, among the plethora of white-gallery shows opening in Lower Manhattan, an old metal shop originally meant for rolling noodles will creak to life on Ludlow Street once more. Only this time, instead of noodles, there will be painstakingly crafted patterns, lines, vectors, and collages. 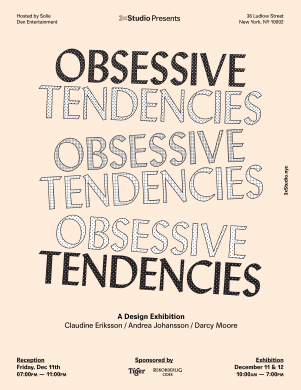 Yes, this odd little space will be the location for Obsessive Tendencies, a exhibition of new graphic design work by multidisciplinary designers Claudine Eriksson, Andrea Johansson, and Darcy Moore. The opening reception will also act as a launch event for the trio’s new collective, 3xStudio. It will be hosted by Solie, singer and curator of Den Entertainment, who is also assisting the collective in producing the show. True to the “3” in the collective’s name, they will be showing three works each.